Terrestrial telescopes have the unfortunate drawback of having to image through several miles of atmosphere. This can lead to ‘atmospheric distortions’ causing images to appear ‘wobbly’. This effect is most apparent in movies recorded through telescopes. Here is an example movie of the moon with some common issues including; camera-motion, camera-shake and atmospheric distortion. Movie is best viewed fullscreen, movie credit: DecemberEves. Now we will correct these issues using the Smart Align registration software. First the video was imported into MatLab, converted to grey-scale and sub-sampled to keep every 10th frame leaving 75 frames. First we need to correct the camera motion. This is done with so called ‘rigid registration’ where movie frames are just translated with respect to each other. We also see that at the start of the movie the bottom of the moon is chopped off – this can be solved by padding the view and stitching together the data that we do have. The offsets were measured between each frame and the previous one before the frames were placed into a new expanded canvas. These offsets are then used to populate the new movie with a larger canvas (the grey background). Where image data was available this was used to fill the canvas throughout the movie. Again this movie is best viewed fullscreen to see the fine details. Atmospheric distortions are observable as the ‘boiling’ texture of localised distortions across the view of the movie (easy to see when viewed fullscreen). To correct for these localised distortions we need ‘nonrigid registration’ where different parts of the images can moved by differing amounts and directions. This video shows the final result with the atmospheric distortion removed. This is not a static image, if viewed fullscreen you can see the random photographic noise texture does change! There are still small imperfections at the very top and bottom of the Moon where the images were stitched but this would be solved by recording movies where the subject is never out of the field of view. 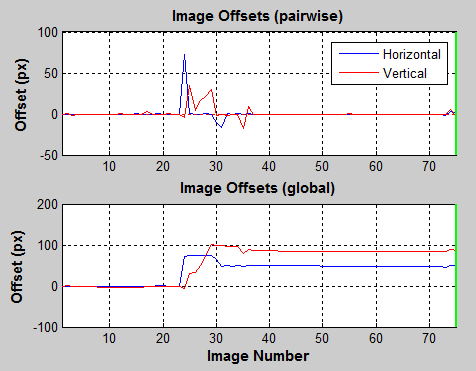 This software was originally developed to correct imaging distortions in atomic resolution electron microscope data but it seems to work for telescopes as well as microscopes.